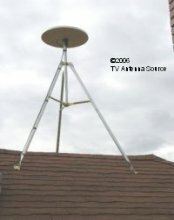 Winegard MS 2002 " The Round Television Antenna"
High performance reception without a rotor. TV signals are received from all directions, providing excellent reception in areas where stations are in different directions. A built-in signal amplifier, provides up to 9 times the received signal. Exclusive modern styling, blends well with homes. A weathertight housing protects the antenna, amplifier and terminals. The reduced size and weight of the antenna makes installation a snap. Comes fully assembled and ready to install. 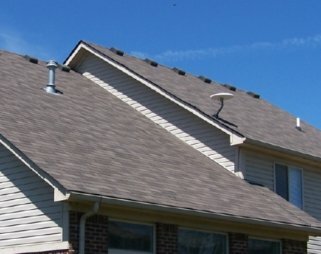 With no moving parts and a weathertight housing, you'll enjoy years of viewing pleasure. Attach coax cable from antenna to power supply. 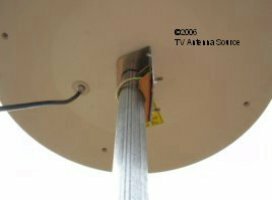 The modern television antenna omni directional was first introduced by the Winegard Co. in the early 1990's. Since that time other manufactures have attempted to copy the design and performance of the Winegard MS 2000 antenna. Winegard Company, incorporated in 1954, has been a leading manufacturer of quality television reception products for over 50 years. During those years, they have made important contributions to the growth and development of the television industry, becoming a respected world leader in the design of innovative, quality products. The Winegard company is located in Burlington, Iowa and has been manufacturing quality TV antennas for over 50 years. Denny's Antenna Service has had the privilege of being a Winegard dealer since 1989. "Helping America Watch Free TV"